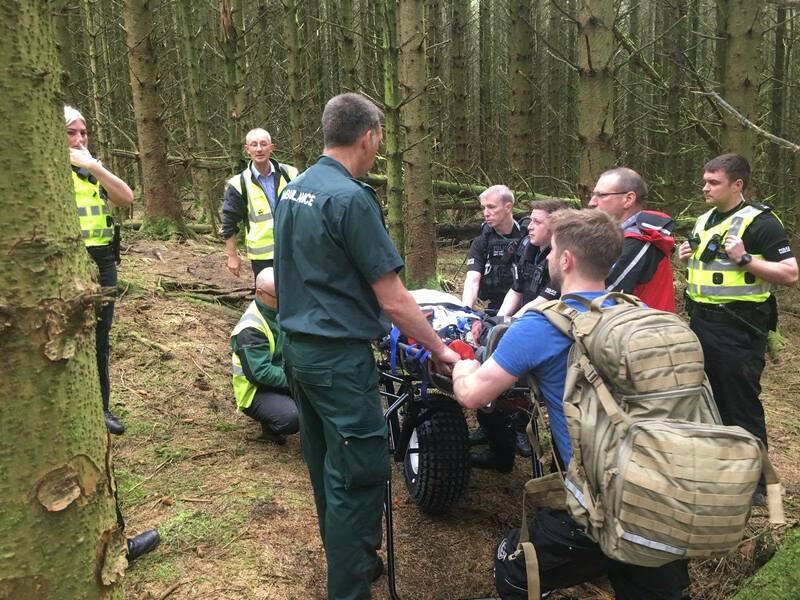 At 1250 on Friday 11 May Police Scotland contacted Moffat MRT to request assistance to Scottish Ambulance Service in Mabie Forest near Dumfries. 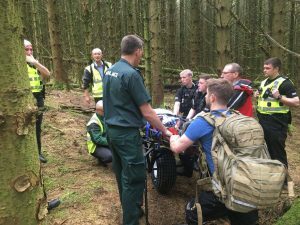 A mountain biker had fallen from his bike and had a suspected neck and back injury in a remote part of the forest. Although the ambulance service had managed to reach him they were not able to extract him. The team responded with a team member quickly on scene followed by the teams 4×4 landrover with stretcher and the team’s Doctor. Whilst the ambulance service treated the casualty the team brought in a specialist mountain rescue stretcher and wheel to evacuate the casualty. Due to the steep nature of the terrain the stretcher had to be protected by a rope belay throughout the evacuation to a forestry track and a waiting ambulance. The team worked closely with Police Scotland and the Ambulance Service to successfully extract the casualty to safety. As members of the team were arriving at the incident in Mabie Forest the police requested the team attend a second incident in the Moffat Hills. A women had fallen and sustained a lower leg fracture. Team members en-route to the incident in Mabie were diverted to the Grey Mare’s Tail to assist Police Scotland and Scottish Ambulance Service with the second incident. As the team was stretched with the two incidents ongoing a coastguard helicopter was requested to assist with the Moffat Hills incident. As team members were making their way to the casualty on the hill, Rescue 199 from Prestick was able to winch the casualty and transfer her to Borders General Hospital. The team cannot operate without the help of volunatry donations from members of the public. Each year the team holds its charity challenge with 4 different walks for all abilities. The year’ challenge is in the Moffat Hills on 10 June. Visit the teams website to preview the routes and enter the challenge.